For the tourists on a trip to drench themselves in spirituality in Yamunotri, Barkot is a place to take halt. Tourists, who are in quest of a snug stay in a pocket-friendly way, can choose Camp Nirvana as it is an accommodation option simply ideal! Located on a bit raised land along the shores of Yamuna is the snug and comforting resort of Camp Nirvana. This hotel is one of the best and relaxing accommodation options in Barkot. The staff of the hotel strives its best to render a memorable and congenial stay to the guests. The hotel offers luxury tented accommodation to the guests and it is exquisitely set up surrounded by pine woods. All weather proof tented accommodation offered by the hotel paves the way for a luxurious stay of the guests. Topnotch amenities are rendered in the tented rooms of the hotel the major amenities among them are morning bed tea, running water, special activity area of aarti and meditation, and more. In addition, there is a multi-cuisine dining arrangement for the guests here. 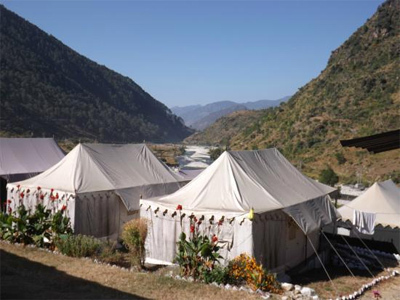 Camp Nirvana offers well arranged 32 cosy tents for a lavish staying experience of its guests. 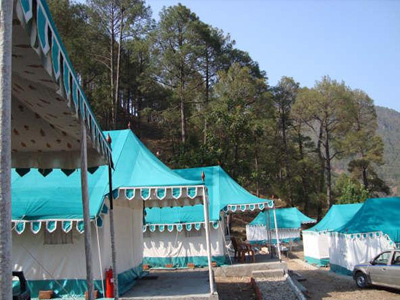 All the tents are highly spacious and comprise of modern amenities like bottled drinking water, attached baths with hot and cold water, etc. Guests can take pleasure of a luxury stay right in the lap of the nature while enjoying fresh air and soothing ambience. The property ensures luxury all-weather proof camps for the convenience and comfort of travellers.